Deep underground aquifers in the American Southwest contain gases that tell of the region's ancient climate, and support a growing consensus that the jet stream over North America was once split in two. The discoveries were made with a new paleohydrogeology tool, developed by Indiana University Bloomington geologist Chen Zhu and Swiss Federal Institute of Technology geologist Rolf Kipfer, that depends on the curious properties of noble gases as they seep through natural underground aquifers. Noble gases (neon and helium, for example) are elements that resist chemical reactions, and therefore have the potential to record information from Earth's past. In the January issue of Geology, the scientists report the results of their tool's first serious test amid the Navajo sandstone aquifers of northeast Arizona. "Getting to the point where we understand the interaction between these aquifers and the atmosphere above is going to open up many new ways to ask questions about the relationship between climate changes and water resources," said Zhu, the report's lead author. "We have shown our approach can work extremely well. It confirms that the aquifer was recharged mostly during the Earth's most recent ice age, and particularly related to the fact that the jet stream was actually two jet streams many thousands of years ago, with the lower descending far to the south of North America." 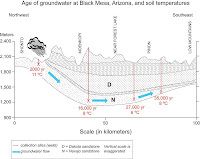 An exhaustive and methodical sampling of ground water from the Arizona sandstone aquifers shows significant changes in noble gas infusion rates and concentration (particularly neon) at key times in Earth's quaternary period (as far back as 40,000 years ago). The scientists saw both an excess of neon about 25,000 to 40,000 years ago, coinciding with the last Pleistocene ice age, as well as an extraordinary peak of neon associated with a flood of groundwater 14,000 to 17,000 years ago, at which time the southern jet stream hovered above northern Arizona. "We admit, the conditions in Northeast Arizona were ideal," Zhu said. "Navajo sandstone is a rock formed from ancient sand dunes. The system there is free of other complications, and that is not an accident. We chose it for that reason. It is possible results won't be so clear if we employ our method in other, similar places around the world. But we are ready to try." Zhu has conducted substantial studies of the Navajo sandstone in Arizona in the past 15 years. When water from rains and streams first enters the ground and seeps through sedimentary rock, it carries some gases with it. The water moves slowly. In sideways-oriented aquifers, water at points more distant from where it entered were thought to carry the indelible stamp of ancient atmospheric and hydrological conditions. Groundwater closer to the point of entry, by contrast, would be recognizably newer. The amount of noble gases carried into the aquifers will depend on a variety of environmental factors, Zhu said. Lower temperatures, lower salinity, and higher pressure can all lead to an excess of noble gases in groundwater. Much like the analyses of ancient air pockets deep inside glaciers and polar ice, the new tool Zhu and Kipfer have developed can't be used just anywhere. To make sense of the noble gas seepage, the aquifers must be protected by an impermeable layer of rock that stops newer water above from mixing with the older water below. As long as noble gases in the groundwater do not mix with large quantities of noble gases from other sources, the noble gases' initial mix will be left alone to change over time. Despite restrictions on where Zhu and Kipfer's tool can be used, there are rock formations all over the world that are suitable for its deployment. Best candidates are the more arid regions of the northern hemisphere, such as the southwestern U.S., the northern Sahara, the Middle East, and parts of western China. The availability of noble gases such as neon, xenon, and helium is believed to have remained relatively unchanged over the last 100,000 years. Zhu said their concentrations in the atmosphere would be controlled primarily by temperature at a given location. Zhu and Kipfer's noble gas data show that soil temperatures were 5 to 6 degrees Celsius cooler (9 to 11 degree Fahrenheit) during the peak of Earth's most recent glacier activity, about 25,000 year ago. Kipfer was the first to suggest neon might be employed as an indicator of ancient hydraulic effects. The present Geology paper with Zhu represents the approach's first empirical test. Zhu says he hopes his work with Kipfer will inform policymakers as they grapple with climate change in areas of the world where populations depend on underground aquifers for their water supply. By understanding how these aquifers have waxed and waned in response to changing temperatures, Zhu says experts will get a better idea of how a warmer Earth may influence the availability of water to human populations in the future. "The more we understand about the interaction between the atmosphere and the water table in the recent geological past, the easier it will be to develop policies that help us adapt to a global warming environment," Zhu said. "We need geologic ground truth for policies based on model forecast."